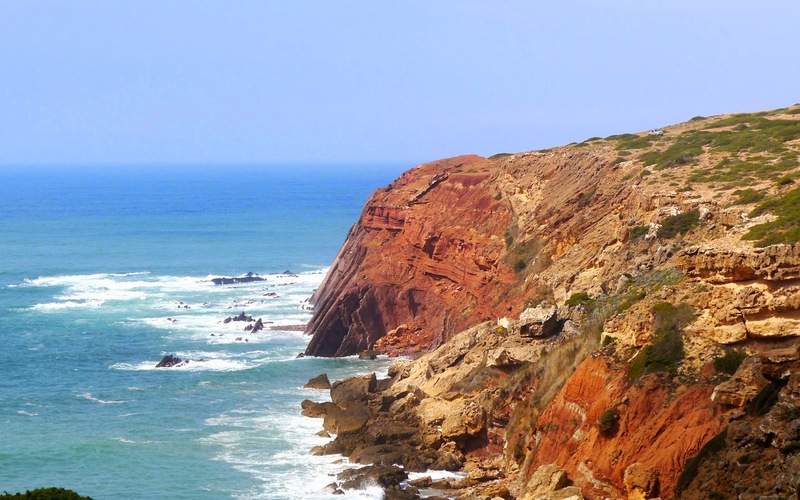 From Vila do Bospo to the end of the walk, the Cabo do San Vicente, is 14km. 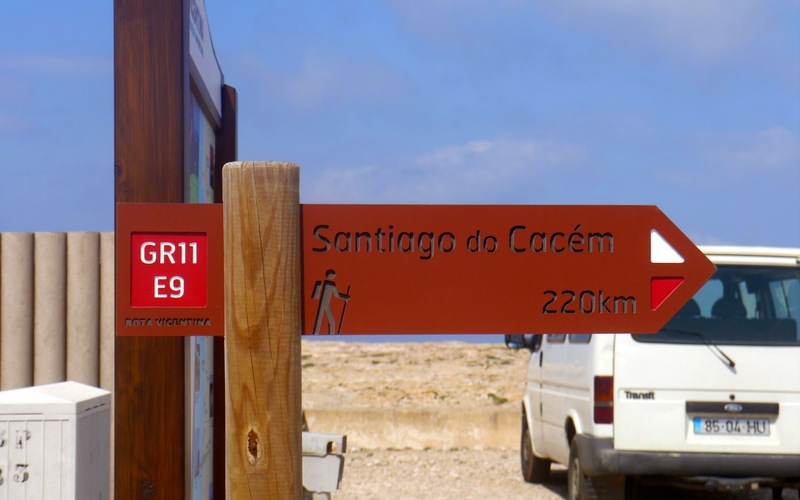 To avoid a simple repeat of the outward journey I walked the last Fishermen’s Way variant, which heads 6km along the coast from Cabo do San Vicente. This variant is excellent which is just as well as the Historical route, the main route, is just a little dull. The scenery on the main route has none of the valley walking I enjoyed on the previous two day's and spends most of its time crossing a huge open but fairly flat rock garden. The multi-coloured vegetation, including broom, erica, lithodora lusitanica, rosemary and thyme provided some compensation on what would otherwise have been a pretty monotonous walk. 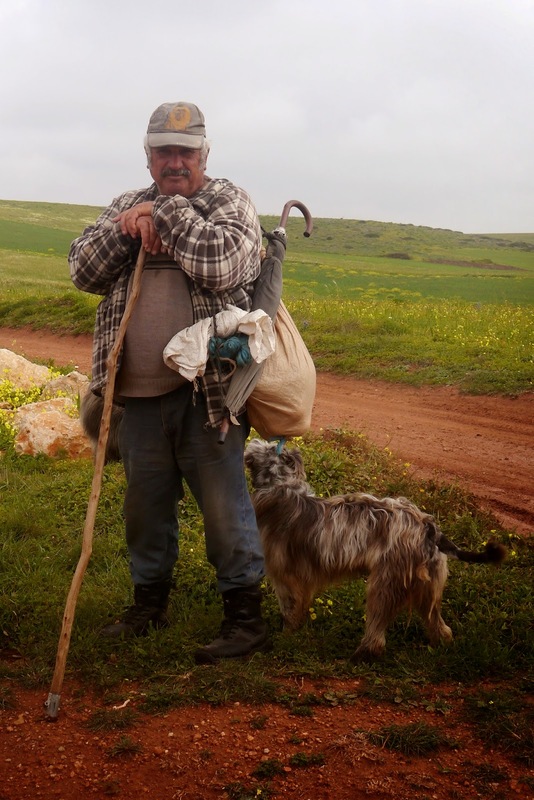 I did meet a couple of shepherds, one of which was herding/shepherding a herd/flock of sheep/cattle/goats and was covered with an animal skin (not sure what type). He was a bit bashful but the second let me take a picture of him. I also met a couple of young Canadians who were walking up the Rota Vicentina and were trying to decide where to go in the summer. Their short-list was the Alps or Iceland - not a difficult choice as far as I was concerned, so hopefully put them on the right track. The penultimate stretch of the walk was along a road, a shame and it’s surprising that given that the route is new that a nicer and more direct route to Cabo do San Vicente couldn’t have been devised. 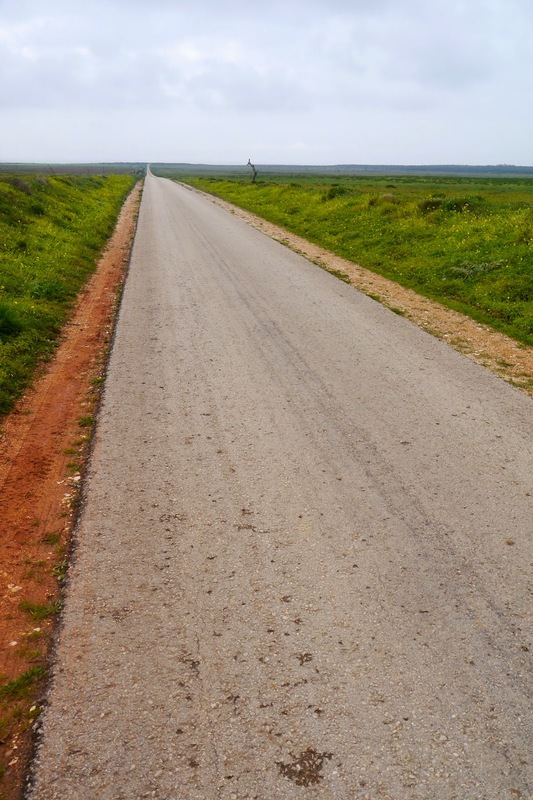 Still, it did provide me with the chance to take a picture of a long road disappearing into the distance. 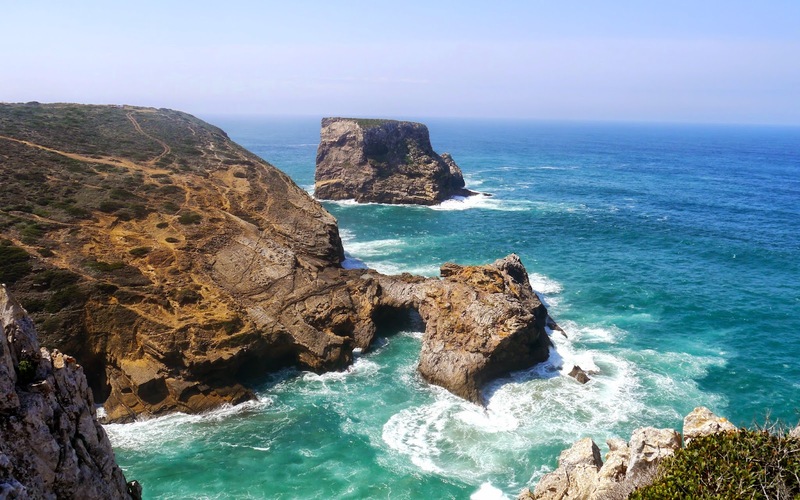 Cabo do San Vicente is Portugal’s and mainland Europe’s equivalent to Landsend but is pleasantly low key and without a massive tourist presence. I was there on a windy Satuday in mid-March. As well as missing the tourists, I also missed the birdwatching season as this part of the coast, and east along to Sagras, is one of the best places in Europe to watch the autumn migration of some 300 species of birds. The next 6kms, heading north along the coast, included some of the best scenery I’ve seen on the trip. The first stretch was densely occupied with fishermen and I actually saw one them with a fish, a huge sea bream which he had hauled several hundred feet up the cliff face. Further along there was a stunning natural arch bedecked with yet more fishermen. In the final bay, on a day that captured the best of the Fishermen’s Trail, a group of surfers (shoal?) bobbed up and down in the sea waiting endlessly for the elusive big wave. After leaving the Fishermen’s Trail, rejoining a now familiar Historic Route, the sky darkened and it started to rain, the first sustained rain I’ve had in 9 days of walking. Tomorrow it’s back to Brighton, where the weather will probably be more mixed. Good Trip, may try it sometime. I'm just off to Uzbekistan to have a look at the cities on the Silk Road - could be interesting! Hope you are keeping to the GR7 in the hills this time up to Andorra - very special. Yes that was me - had a great time - Andrew and Julia very good company.